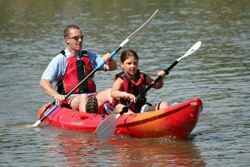 Norfolk Canoes stocks a wide range of 1, 2 and 3 person sit on tops for family fun. 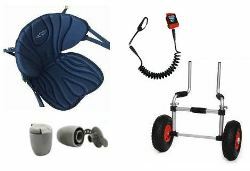 Inflatable and fishing sit on tops are also available along with paddles, accessories and equipment. A single seat sit on tops are fantastic for getting away from it all. Whether you're looking to start out exploring your local rivers or after somthing to get more out of a beach holiday, we're sure to have the right boat for you. Get the family out on the water for an adventure with one of our 2 and 3 person sit on tops. 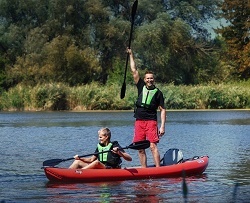 Perfect for bringing the family closer together with regular kayaking trips or just adding to the fun on holiday, these kayaks are sure to put smiles on faces. 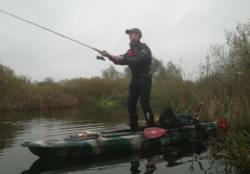 Whether you're lookiing to take up fishing for the first time or tired of watching anglers afloat catching more than you are from the bank, fishing from sit on tops is rapidly becoming one of the most popular paddlesports in the uk. 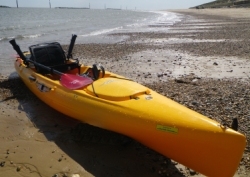 Love the thought of kayaking but don't have the storage or transport for a rigid boat? Don't panic, with one of our range of Gumotex and Sevylor inflatable sit on tops you can still get out there andstart enjoying our waterways. We are authorised dealers of the full range of Hobie Kayaks. Hobie sit on tops are truely unique with their pedal drive system. You can pedal, paddle or sail Hobie Kayaks! Outfitting your sit on tops can be almost as much fun as paddling them. 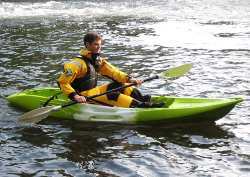 We stock a wide range of equipment and accessories for your kayak. From seats and leashes to trolleys and kayak fishing kit. If you're just starting out and would like some help in choosing your sit on tops, then please call us on 01603 747139 where we will be happy to help.